Thank you to all our volunteers, board members and staff who worked hard to make the first Negros fundraiser a success. We had over 200 guests who came and enjoyed the delicious food buffet dinner at 21 Restaurant. And the silent auction, a first for most Negrenses was a success raising P18,000 to benefit a graduating student at St. Francis of Assisi School with a college scholarship next year. Thank you to all the sponsors who made our event possible. Premiere Sponsors: Migahay Co., RA Financial Services, Inc., Tinihaban Agricultural Corporation, Lonoy Agricultural Corporation, Asociacion de Hacenderos de Silay-Saravia, Inc., AHSSI Planters Multi-Purpose Coop., SMART Communications, Inc. and SWIP Travel Inc.
Table Sponsors: Misyel’s Catering, Hilo & Stitch, Twin Shell Service Station, AVIDA Land Corporation, Datalink Technologies, Inc., and Prudential Guarantee and Assurance Inc.
Silent Auction donors: The Sylvia Manor Hotel, Lopue’s East Center, Negros Saturn Marketing, Association of Negros Producers, Royal Wellness Spa, Negros Navigation, Trattoria Uma, Mrs. Joy Magalona-Barreiro, Mrs. Margie Ledesma-Abello, Julie’s Flower Shoppe, Roli’s Diner, Play Studio, Style Bacolod Inc., Bascon Café, Chicken House, PAPEL Handicrafts, Tumandok Crafts and Industries, Dir. Jay Abello, and Mr. Edgardo “Jack” Ledesma. Other donors: Silay-Saravia Railways Cooperative, Bacolod Fertichem Inc., and Trims and Treasures. 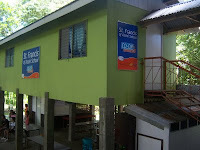 SFAS Coop Net Center - A First in Negros! 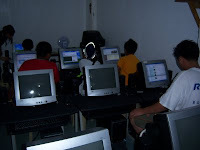 The St. Francis of Assisi School of Silay City recently received ten (10) more personal desktop computers from the Tapulanga Foundation. 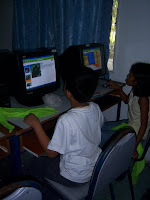 Last October 16, 2008, the computers were installed and activated, increasing the school’s total number of computers to twenty (20). Resulting from various fund-raising projects by the school’s administrator's Ma. Carmela "Micmic" Abello-Golez’s friends and family in the USA and a partnership with Intel Technology Philippines and Asianic Computers, the school received 10 brand new Intel-equipped desktop computers. 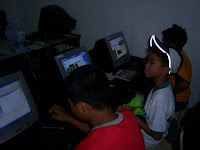 Under its Coop Net Center program, Intel Technology Philippines assisted the Tapulanga Foundation in providing the school with affordable computers in addition to refurbishing and dressing-up the school’s computer room. Intel supports the Tapulanga Foundation’s vision of sharing God’s gifts through educational projects that provide students with more opportunities. With this project, Intel hopes to provide the students and the community with access to a wide range global learnings and technology transfers via the Internet. Equipped with Intel Core Duo processors, the new computers also give the students increased productivity in performing various computer tasks and enhance their computer skills.